Those people have tier two set. Thrall is the hardest because the guards and Vol'Jin helping Thrall. Basically you're vsing 3 Bosses because there are a lot of guards it looks like a boss. But more skilled guilds can defeat Thrall with 30 people. Thrall and Vol'jin are harder then Sylvannas and the Dreadlord BTW. Thrall does not hunt, because hunting implies that there is a chance of failure. Thrall goes killing. Thrall is the orc hero of Warcraft three. He is the son of Durotan, a hero in previous warcraft titles, and was born into slavery. His master taught him the arts of fighting, and eventually he was freed. He picked up the title of shaman and warchief of the frostwolf clan, and joined forces with Grom hellscream, who was posessed by demon entities. After warcraft 3, he created the city of orgrimmar, where he now stays and watches over the orcish population. Thrall is the weakest of all faction leaders, which is a bit of a downer for the alliance. It would be great to be able to pick up swords against the true hero from the original warcraft rts series. Looks like he moved to the Outland..
Thrall: Eternal Badass of the Horde. Atop his throne of gold, the safety of Orgrimmar he keeps. He parties with the ladies, makes all the other men weep. Can drink your weight in whiskey, can drink your weight in rum. He'll drink and drink then drink some more, this guy is loads of fun. Thrall is a groovy Shaman, renowned through all the land. Thrall is our champion, the son of Durotan! It's three o'clock in the morning, and you'd better believe I'm tired. But even in this messed up state, it's Thrall who I admire. Thrall says "I love the alliance!" Hey. Inside is a pretty hard thing to get in. If you're alliance that is. But I made it in with a lot of dead walk and sprints. - Some flash powder helps too... I put a picture of me and my Horde homies chilling in the throne room with Thrall! - The agro in there is crazy! Some people see Thrall as more of a warrior-type leader. Thrall is more of a Shaman/Warrior hybrid. As seen in Wc3, Thrall is a hero type know as a Seer. The Seer was able to cast ability's such as Chain Lighting, Far Sight, and Feral Spirit, which allowed him to call upon the help of two ethereal Wolves. I'm not to sure if Blizzard had added these ability's to faction leaders, because that would surly make battles with faction leaders truly epic. Thrall is a shaman class leader and only shaman not warrior/shaman. He has surprisingly little health, lol. I'm thinking two PUG raid groups could thrash him in no time. Anyway, Thrall is more of a Shaman than a Warrior if you ask me. After all, Thrall was the one who brought the Orcs back to Shamanism, and away from bloodlust and mindless killing. He's one of the shaping figures of the Warcraft Universe, and an infinitely more trustworthy character than say, Sylvanas or Kael'Thas. Also what is his exact lvl? last night he was summoned to Nagrand by a guildie and he had 1.01million mana i can just imagine what kind of health he has. The health listed above here are incorrect. Would he be close to like lvl 200 or something similar to have that much mana? So say you kill Thrall, you get rep with Darn' SW and IF. Also, I hear you get Honor for killing him too. Thrall can be pick pocketed. I was on my Gnome Rogue, Rascelle on Feathermoon server, and sneeked all the way to him. Pretty simple as no gaurds seem to detect stealth. I got up close to him, distracted him, tried to sap (but he's immune) and I pickpocket'd him. I got a Smoked Talbuk Venison and 75s. But as soon as I did, he detected me and I aggro'd his whole throne room and got squished. Anyone know how much health he REALLY has...he has alot more than 50k and sylvanas..it says she only has 4k and they both probably have 5mil or more. Haha, taken back when orc shoulders looked pathetic. 1. We tried pulling Vol'Jin into the first room of thrall's building. Thrall and half the room followed. 2. Have 1 guy tank Thrall, with a couple of good healers on him, and have the rest of the raid burn down Vol'Jin, it works pretty well that way. 3. Keep most of the raid behind Thrall, apparently Chain Lightning can't strike behind him. but i could be mistaken, but it appears that it works that way. The hard thing about raiding Thrall and Orgrimmar is all the hordes.. and as akirabrewer says, you're fighting 3 bosses and against the most used horde capital.. this is the reason to why so many raids on Thrall goes to hell.. Pvp guys! There has almost been no raids on IF that has been succesfull.. why? Cause there is a dusin of Ally's there! This is why raiding Thrall/Orgrimmar is so hard! whats hapening to the creatures health on wowhead? thrall doesnt have 430 hp..
as of 2.3, Thrall got tired of standing up for 2 years, and has decided to -Sit- down on his chair. What is his loot table for alliance killing him? What does he drop? wow steal chuck norris jokes much? Lore: The armor he's wearing belong to his master, Orgrimm Doomhammer, who was also Durotan's, Thrall's father, best friend (His cry in WC 3 "For Doomhammer" says a lot of it). Thrall is Orgrimm's heir and, after his master perished, he "inherited" Orgrimm's black armor and magic hammer. Suffice to say, Orgrimmar was named that way in honour of this same Warchief, Orgrimm Doomhammer. Thrall has been 2manned by a level 70 warrior and a priest. Quite an accomplishment. what is the meaning of killing him, actually? do you get a high amount of rep with alliance, is it a quest, does he drop good gear, for fun, does his head get on a pole and give a buff to the entire city of SW/IF? what? WOW Insider hosted an election for the leader of the Horde/Alliance, and the Supreme Ruler of Azeroth. The results of the primary elections are in. In an unsurprising landslide victory, Thrall was confirmed as leader of the Horde faction by capturing 69.7% of the vote. The bitter race on Alliance side led to a down-to-the-wire victory for Dwarven King Magni Bronzebeard who pulled in 24.9% of the vote. A distraught High Priestess Tyrande Whisperwind, who received 24.5% was denied a recount in the Wetlands. It is time for the final election for Supreme Leader of Azeroth. Thrall hopes that his political momentum will keep up through the general election. Thrall promises to consider the needs of all races in Azeroth in his official decisions. His primary goal is to unite the civilized people in hopes that someday there will be peace across the lands. Other Planks in Thrall's platform include balance, buffs for Shaman, and strong foreign relations with the sovereign people of Outland. The Warchief's bid for Leadership in Azeroth has been officially endorsed by Rexxar and High Chieftan Cairne Bloodhoof. Bronzebeard, fatigued from a difficult primary season, remains the family values candidate. He is in favor of exploring Azeroth and would prefer to relations with Outland to a minimum. Bronzebeard has been recently quoted as saying "Feel the fury of the mountain!" The king's promise to recover Gnomeregan has won his campaign the support of High Tinker Gelbin Mekkatorque. This powerful sorceress has recently announced her independent candidacy for Leader of Azeroth due to the astounding amount of support she received as a write-in candidate in the Alliance faction race. Proudmoore has shown remarkable leadership skills in the foundation of Theramore, and is one of the last surviving heirs to the founders of the Alliance. Former Alliance candidates Highlord Bolvar Fordragon and High Priestess Tyrande Whisperwind have pledged their support for the Proudmoore Campaign. As promised, we now announce the Supreme Leader of Azeroth. And the Winner is- Thrall! Thrall carried a lead throughout the election and ended the race with 55.3 percent of the both, more than either of the Alliance candidates combined. Lady Jaina Proudmore finished the race in second place with 34.3 percent of the vote. King Magni Bronzebeard was disappointed in his 10.4% share of the vote, and has promised a better showing in future elections. 430 health? is Thrall sick or something? Thrall does not T-Bag, he potato sacks. All of the NPCs I've seen on wowhead lately have incorrect health values. Lol, me and some friends were messing arround in the city the other day and ended up hiding next to Thrall's chamber around the corner to get outta combat. Theres a huge alcove that wrapes around behind him where noone can see you. We just happned to have 4 of us and a lock when we rembered you can use trade chat in horde cities to talk to people in all alliance cities. Long story short we had a full 40 man raid puged and summoned in about 10 min bf the horde even knew anyone was in the city. I tend to disagree on the life drain from Vari not being " that bad " I've seen first hand him decimate raids with it. Quick Lore: Thrall's Mother and Father Durotar and Draka were killed while he was still young by assassins from Gul'dan i believe it was, Orgrim Doomhammer in some ways blamed himself for not offering them more protection as there guide (one of doomhammer guards) Turned out having alliegence to Gul'dan however the Assassins killed the Guard in the battle. Durotar fought hard but eventually fell, The babies cries could later be heard by Blackmoore who came and despite the warnings of his assistant took thrall and raised him in slavery. As thrall grew up he began to wonder about his people and thanks to a man known only as Sergant he was able to read and write blackmoore cared little for such things but was convinced to let thrall learn to read. Thrall also gained a friend in the human Taretha foxton eventually she was beheaded by a drunkern blackmoore who then proceded to throw her head into thrall causing him to fly into a rage unleashing the power of the elements and leveling Durnholde keep. Most of the info comes from the Christie Golden novel " Lord of the Clans" I'd advise anyone who is into lore to read it as it's a very good book. The only reason i think Orgrimmar is easier to raid is because all of the alli use the side entrance(Which I think is stupid and they should and cheap). But if there was no side entrance Orgrimmar would be impenetrable because 1) The invaders would have to fight Saurfang on there way in (and we all know what he can do), and 2) they would have to pass through the Bank/AH area( which is the most populated place in any of the Horde cities). So ya I belive that UC is only harder to raid because of that side entrance in Orgrimmar. The only reason i think Orgrimmar is easier to raid is because all of the alli use the side entrance(Which I think is stupid and cheap). But if there was no side entrance Orgrimmar would be impenetrable because 1) The invaders would have to fight Saurfang on there way in (and we all know what he can do), and 2) they would have to pass through the Bank/AH area( which is the most populated place in any of the Horde cities). So ya I belive that UC is only harder to raid because of that side entrance in Orgrimmar. Well, not 'Master' by modernified (is that a real word? O_o) sense, but as in a Master-Apprentice, Teacher-Student, situation. Possible pop-culture reference: There is an episode of Star Trek: TOS called "The Gamesters of Triskelion" (1968) in which Kirk, Uhura, and Chekov are captured by a race that forces them to fight while placing wagers on the outcomes. The Providers--as their captors are called--refer to their unwilling gladiators as "thralls." I searched WoWwiki--both the article on Thrall and the listing of pop-culture references--and could not find any mention of a link, but considering that Thrall was raised as a gladiator by his human captors, it seems reasonable to assume that this is the source of his name. Thrall leads the Frostwolf Clan, the leader of the Warsong clan is (was) Grom Hellscream. IMO remove the side entrance, allies are the only ones that use it. any ideea what's the respanwn timer of Horde and Alliance Leaders? I believe it's about 30 minutes? I could be wrong. Désormais, vous pouvez acheter de l'OR pour WoW avec votre téléphone ! Les prix sont vraiment très très bas et vous n'avez pas besoin de carte bancaire ! Respawn for Thrall confirmed to be ~2 hours. Camped his room mass slaughtering horde til he respawned 1 hr 55 mins after his first death, so it's most likely 2 hours from the time he was engaged. Totally awesome that when I finally get around to playing a DK i get to Org and he's dead. 2 hours is a bit much since you're technically not supposed to multi-tap for kills. As far as i know all the leaders have 2 hour spawning time. The respawn time on them is ~2 hours. The respawn time is roughly 30 minutes. When Raiding thrall you should have atleast 25 80s because as soon as the horde know Thrall is gettin owned, they come rushing in. Also make sure you have people who you know, trying to PuGThrall then your going to get 5+ retards who want to go in and aggro thrall and totally stuff up the group. Our raid managed to kill Thrall and leave before the Horde even showed up to stop us. We snuck a rogue and a druid in stealth through the side entrance and up to the big empty area right outside thralls chamber to the north. Next we had a warlock Corpse run to that same area. He sat there for a second to let the horde settle down (we didnt attack guards back so there was no alert) and he respawned and summoned the entire raid into Orgrimmar. We went right around and Nuked thrall and portaled out to stormwind before the horde showed up. And if you try this method, do not meet anywhere in barrens, just have everyone summoned form stormwind. i dont like how the alliance have to kill two bosses in the hordes most populated city on my server while the horde has to kill one in SW and IF. The Doomhammer was a mace in the orc clans that was highly respected even for enemies. The Draenei even knew of this too. Anyway, there was a prophecy foretold of it that the Doomhammer would help lead the orcish people away from the brink of death. But it would'nt be of the Doomhammer orc line. (Chieftain to son to son to son to son.....)Velen recognized that Orgrim will inherit the Doomhammer. At this moment Orgrim realized that the only time he will get it is the day his father died. He realized how mature and skilled he had to be to wield it. Fast forward a few years, Orgrim is now the Horde Warchief for the invasion of Azeroth. He overthrew the Blackhand clan for leadership. Rend and Maim are @#$%ed but they dont say anything. Orgrim still saw use for Gul'dan when Gul'dan presented him with Gorefiend the VERY FIRST DEATH KNIGHT (yes Death Knights were made by ORCS first.) He reluctantly agreed not to kill Gul'dan even though he could roflstomp right at the moment. Anyway, orcs win at Blackrock Spire, horde decide to keep heading up north to wreak havoc on human and dwarven kingdoms. For the record the orcs did kill stormwind in a sense and Stromgarde and ALMOST Loarderon. They almost got Ironforge but they didnt get pass the gates. Anyway, Gul'dan and Rend team up to seperate the horde and then all the clans are seperate again and then Orgrim is like "whoa wtf happened?" (the feeling you get when you are holding the flag in WSG and then your entire team goes after the other flag carrier and your pretty much dead by then because the other team is camping the tunnel and ramp) Anyway, Orgrim needs time to think so he pretty much exiles himself and leaves for a few years to think what just happened. Anyway, fast forward a few more years! Thrall is hanging out with the Frostwolf clan after chilling with the Warsong Clan and pretty much getting a brother Grom Hellscream (hell yeah! pun not intended) Orgrim comes to thrall as a stranger and Drek'thar (the blind shaman in AV) doesnt tell thrall this because hes thinking "man this is gonna be fun to watch" Anyway, Orgrim talks smack about himself (literally) saying that "Orgrim was nothing but a coward who could not lead his people" Thrall was like "wtf" because his Dad, Durotan, and Orgim were best friends and thrall wanted to meet him. Thrall was %^&*ed at the stranger (Orgrim) and so he challenged him. The elements wanted to help but thrall said no. Orgrim just looked at him and laughed and pulled out the and they dueled and since Sergeant (Thralls human trainer) taught him a crap load of fighting stuff thrall beat Orgrim by taking his hammer and bringing it down on his face. Orgrim laughed and took the hammer away from thrall and was happy to be beat. saying "Not many have beaten me in quite a long time" So he tells Thrall that he is Orgrim and Thrall was freakin out like "holy crap man, i worship you! Don't kick me out of your fan club" And Orgrim offers him a job to help him free the orcs of the Internment camps and thrall said sure. Fast Forward to the 2nd to last camp being freed, Orgrim is shot with a arrow in his back (inconvenience ftl) And Orgrim gave Thrall the doomhammer and his black plate armor. Thrall tells his army of orcs that Orgrim appointed him Warchief of the Horde and everyone is happy and sad but thrall tells them "Not to mourn him, he recieved a battle-related death (greatest honor somehow) and that he will not be forgotten so long as the Doomhammer is fighting for the right cause" or something. This is the reason Thrall now has the Doomhammer and black plated armor even though hes a shaman. I haven't seen this mentioned previously, or seen it listed anywhere as one of his abilities, but does anyone know if Thrall is able to heal himself during a raid? Just last week I was helplessly watching him get beat down to 400k, with no relief in sight, when suddenly his health began to dramatically rise over 10 seconds, to back over 1.3 million (and I made sure I was looking at both of those figures right, his health bar was moving upward even as he was being hit). By that time, Horde reinforcements arrived and overwhelmed the Alliance, with the DKs death-gripping the healers into the doorway, where they were repeatedly hit by strangulates, silences, stuns, and counterspells, wiping the raid, as I HoJ'ed the MT and helped Thrall take him down :) Anyone have an explanation, or seen this happen before? Does he ever get tired of sitting down? I mean.....He's been doing it for a couple years now. You fail. That is an old Chuck Norris joke. Hmmm, my comment was purged, not sure why. But I said "You fail. That is an old Chuck Norris joke." Could anyone tell me why that would be purged when I am right? You are right, but your observation was neither insightful or funny so people (such as me) choose to downrank your comment. However, that user's comment was humourous because they replaced the object of a common real life cultural joke with Thrall. Thrall: Pretty nice throne u got there ! Thrall: Hehehe , now to sit for eternity. Newsflash , new achievement , kill Orgrimmer leader thrall! Thrall: HOLY $I-I!T , GG blizzard. Trade Chat: WOW , U ARE AWSUM ! They made his comfy chair smaller, why Blizzard, why? In advance, if you think I'm wrong rate me down if you want. This is my two cents and after a bit of brainstorming I think, putting aside politics, Thrall is fighting a losing battle. He has fought to try and "free" the orcs from the demons enslavement, but infact the corruption fed to the orcs preyed on their emotions. The orcs became monsters who butchered not because they were whiped and forced to by demon masters, but because they tasted chaos and liked it. Essentially the corruption was a drug for them, the demons gave them the "drug" and they had no intention (at the time) of being freed from it. Skipping ahead WoW years, the orcs beleive they were freed when Mannoroth died. The assumption was that after Mannoroth died they were free from the demons corruption. Again, they were never imprisoned in the first place. In truth, the only purpose to Mannoroths death was that he was a source of the corruption, and simply put, the orcs killed their dealer. This means that Mannoroth cannot be used to corrupt new orcs or strengthen the corruption in green orcs, but Magtheridon and other pit lords can be. Also, some people beleive he is fighting to ensure peace with the Alliance. In his own mind, this might be true, but as a whole this wont ever happen with the horde. The horde has made "necessary evils" time and time again, such as the bloodelves using demonic energy, the inclusion of undead in the horde and their expirements, and ofcourse the appointment of Garrosh. Most importantly is you, meaning the player base, most of you will think Thrall wants peace with the alliance and after reading this will flip on WoW, join a battleground and kill Alliance forces. Seems self explanatory to me thrall may want peace, but you are still bloodthirsty hordies. Truth is I think his peace-with-Alliance attitude is a propaganda attempt by Blizzard to get more horde players. People will start looking at various Alliance characters and lore, think they're evil and reroll to horde. Other propaganda can include Saurfangs power, the tauren chieftains band, and I suppose the bloodelves to a lesser extent. Oddly enough, Thrall had a new model or armor set in the Ulduar trailer. He looked pretty badass. Alas, it's not yet implemented. Thrall gives you a tour of his "crib". After we slaughtered Thrall we took out the whole city. Renata from World of Warcast found out that one of her ancestors was Canadian, and her name was Thrall. So I guess Thrall's canadian, eh? Thrall isnt like most of the horde,thrall actualy has a thing for humans,he doesnt want to slaughter them.He was probably like that because of his relashionship with taretha. Lok'thar, friend. What is it you wish? Lore: After turning in Messenger to Thrall, we see a short cutscene where Thrall leaves his throne and walks slowly down the stairs in shock. "Thrall says: My people have survived in Outland..."
"Thrall says: Unnoticed for years..."
Noticing that Thrall is kneeling at the base of the stairs, Eitrigg comes rushing over. "Eitrigg says: Thrall! My lord... are you all right?" "Thrall says: I'll be fine, Eitrigg. We must begin preparations... I need to go to Outland at once!" "Eitrigg says: With all due respect, Warchief. Our enemies would take advantage of your sudden absence if we don't prepare properly." Thrall walks back up the stairs, and turns around after a moment of thinking. "Thrall says: You are right, Eitrigg. The timing is unfavorable. Make sure our best ambassadors are sent as envoys to Hellscream." "Eitrigg says: At once, sir! For the Horde!" "Thrall says: If he's anything like his father, allying with the Mag'har will mark the dawn of a new age for the Horde." how much honor does thrall award when you kill him? So... he's becoming a new guardian of Tirisfal? Voiced by the man himself, Chris Metzen. Sadly Thrall is one of the weaker city bosses (Vol'Jin is actually much better). Chain lightning is easily healed through, and shock is pretty much a no issue (And doesn't even interrupt if I recall right). too bad for Thrall, because in Cataclysm Garrosh will be the new Warchief of the Horde . what was the name of his mother ? Wouldn't it be awesome if he kicked you from the Horde if you did /lol on him? What is his respawn time? During the Valentine's Day event the Alliance seem to love killing off the Horde leaders. It's one of the few ways they can legally grief Horde players, since it denies them all of the daily bracelet turn-ins. thralls true name any one here u Go'el son of Durotan. Thrall's name, as revealed to players in the http://www.wowhead.com/?quest=10212 quest, is Go'el. This is the name that his father, Durotan, told the Greatmother he would name his son, before crossing the Dark Portal with his mother, who was pregnant with Thrall. Thrall's parents were killed before he was old enough to learn his own name, and he has said that he will always refer to himself as 'Thrall,' even after learning his true name, apparently. As a point of interest, Go'el is an old Hebrew word with a meaning that is especially applicable to Thrall and his position within the Horde. 'Go'el' means 'kinsman redeemer' in Hebrew. In the religious sources of the real world (AKA the Bible/Testament/Torah/etc), the go'el was a person who would do righteous things for a near-kinsmen, as in somebody he was close to. In the game, Thrall as Warchief seems to be constantly seeking to mend the wrongs that the Horde has committed in the past. In this, he acts as an individual doing righteous things for the benefit of his people, which obviously includes those that are not actually part of the Durotan line or the Frostwolves. In Judaism, the Divine Go'el is another word for God, in this case as a redeemer for all of mankind. While of course the game does not follow the same logic - why would it, that would be silly - the reference is obvious. Regardless of what IMDB says, Thrall is not voiced by Harlan Hogan. Thrall's voice is provided by Chris Metzen. When you try to raid Thrall, You better not be small. So, for a weapon, it appears that Venerable Mass of McGowan is the closest thing i have found to the Doomhammer model in-game. The chest is a tough one, as the only one that i can find is the paladin tier Lightbringer Chestguard but the colors are wrong. if anyone can find a better-colored match, that would be great. Chris Metzen (who is the creative director at Blizzard) actually voices Thrall in Warcraft III and WoW (plus it's expansions) not sure why wowhead got that wrong. thrall is nothing compared to saurfang! To bad Thrall isn't as hard as he used to be back before WotLK all of the major city bosses were hard Bolvar Fordragon being the hardest of them all. does someone know what Thrall drops? I spawned Thrall and King Varian on a private server once and when I came back later, Thrall's health was full and Varian was at half. Cataclysm lore from http://www.wowwiki.com/Thrall Thrall appears on the Lost Isles, part of the goblin starting zone. As the storyline plays out, we learn that Thrall was captured by agents of SI:7, and the goblins, having recently fled Kezan, play a part in rescuing him. In gratitude Thrall aids the goblins in their battles across the Isles, where after beating Trade Prince Gallywix, he proclaims that the Cartel will join the Horde and have a home in Azshara, and allows Gallywix to remain as the Cartel's leader. As one of (if not the) pre-eminent shamans of Azeroth, Thrall steps away from his duties as Warchief to join with the Earthen Ring. He journeys to the Maelstrom at the center of the Great Sea, where Deathwing made his return to Azeroth from the depths of Deepholm. The corrupted Aspect's entry has shattered the barriers between Azeroth and the Elemental Plane, and Thrall lends his powers to stabilize the rift. In his absence, Thrall names Garrosh Hellscream as Warchief of the Horde. Ok, so as you all probably know by now Garrosh is supposedly replacing Thrall as the leader of Orgrimmar. I have heard that Thrall is moving to the New Council of Tirisfal ... people are saying this will cause open conflict to erupt but, surely it would be in the councils minds to keep the truce between the factions while remaining unbiased, basically acting when there is violence between the factions and taking care of the aggressors! It just seems silly that Thrall would migrate from Orgrimmar to The Council and let war break out all the while, having joined The Council to try and help Azeroth ... If you get what I mean? 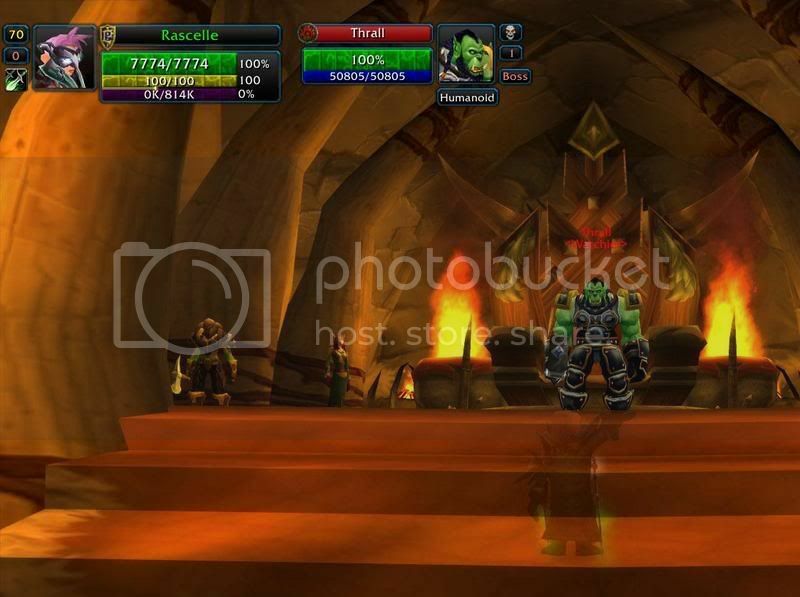 From what I have seen in the Cata beta screenshots etc... Garosh(although, after getting real buff, or slightly mutated since the cataclysm hit) is titled <Warlord of the Horde> making me sway more toward the assumption, that Thrall is still in charge, but just not seated in his throne...for now! Anyone else wanna shine some light and opinion on this? I'm not sure if pulling Vol'jin aggros Thrall was ever true or if it changed, but I recently witnessed an alli raid attempting to clear the guards in the first room and someone pulled Vol'jin into the first room while Thrall was still sitting in his throne. Question: Can you still grab the For The Alliance achievement if you successfully kill Thrall during his visit in Nagrand? Thrall says: Let us begin. Garrosh Hellscream says: Are we not going to have more witnesses? Garrosh Hellscream says: No, Warchief, this is enough. Thral says: You know that these are troubling times for the Horde. Our supplies dwindle. Our lands are barren. Our warriors are in need of rest. These are tasks that must be addressed for the good of the Horde. Vol'jin says: Da people be happy with our success in Northrend. Garrosh Hellscream says: "Our" success? Troll, you played no part in the Horde's victories in Northrend. While I led our warriors against the Lich King, you merely took back a few scattered islands. Eitrigg says: Garrosh! Vol'jin! Hold your tongues. There are larger issues at stake. Vol'jin says: Forgive my outburst. Warchief, please, continue. Thrall says: Despite our success in Northrend, we face serious problems that cannot be solved simply by axe and sword. Earthquakes shake every region. Elementals ravage the countryside. I can hear our land, Azeroth, cry out in pain. Garrosh Hellscream says: These are the reasons that you must leave. Thrall says: Yes, I leave for Nagrand to learn from the elements there. They have suffered and seen many of these same symptoms. Vol'jin says: How long you gonna be gone? Thrall says: It may take time to learn what I must. I trust I will not be gone too long, but it could be weeks - even months. Thrall says: In my absence, I am instructing you, Garrosh Hellscream, to lead the Horde. You have the strength and courage that our people need to survive in these trying times. Garrosh Hellscream says: I am honored, warchief. But I feel unprepared for the life of a ruler. Thrall says: You will not be alone. You will have advisors: Cairne, Eitrigg, Vol'jin. They will help guide you. Thrall says: And though I am leaving soon, I can also instruct you. Vol'jin says: A good first test may be dealin' with dese cultists. Da people be scared. Dey aren't sure what's goin'on. Eitrigg says: Now you are thinking like a ruler, Garrosh. You must look at all sides of a problem. Consult with your advisors and act with confidence. Thrall says: They will help you Garrosh. And I will help you. I will find the answers that we need to assuage the fears of the people and soothe the elements. Garrosh Hellscream says: I will not fail you, Warchief. I will lead as well as I can, and I will consult with the advisors you suggest. I know what a tremendous honor you do me, and I will strive to be worthy of it. Thrall says: Then it is done. Thrall says: Let everything you do be done for the Horde. Vol'jin says: For da Horde! Eitrigg says: For the Horde! Garrosh Hellscream says: For the Horde! Is killing Thrall going to be a feat of strength since Garrosh is going to be the new Warchief? I'm not sure if this was intentional or not, but the name "Go'el" is the phonetic equivilent of the Hebrew name that means "Kinsman Redeemer". Very deep, and if you've been able to read up on any of the Cata content very appropriate. As of patch 4.0.1, Elemental Invasion Phase 3, this Thrall is no longer in the game. I voted for Basic Campfire. Please save the world soon, Thrall. Garrosh killed Bloodhoof, broke off ties with the trolls, is at ends with the Forsaken...the Horde's going to fall apart under his command. Who are the cooking recipe vendors in Orgrimma? every frickin thrall fan is gonna kill me for this, but this game is called world of WARcraft if you play this game at all, you probably joined to play a WAR game, so why does everyone like the wow hippies like thrall and jaina eh? Oh Thrall what happened to you?.. Click "View in 3D" to see his new model. 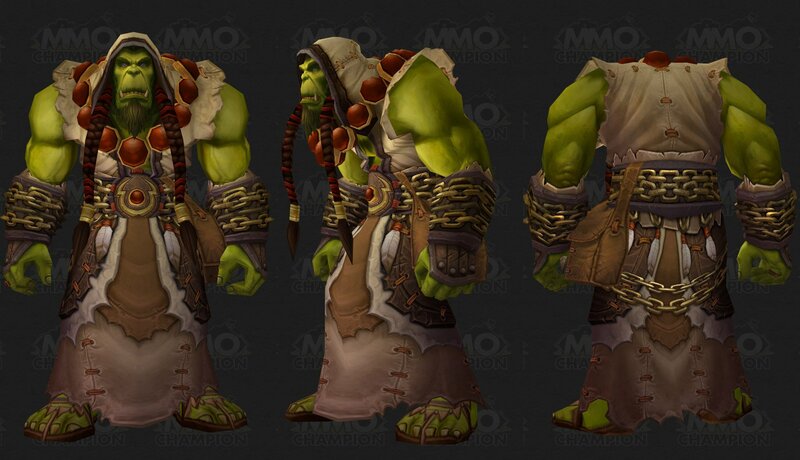 Once again, Thrall shares the PC model for an Orc! \o/ Hooray! Why is Thrall the only Orc with eyebrows? He might have a different upbringing, we wanted his model to feel more human. Thrall, son of Durotan, is the Warchief of the restored shamanistic Horde, and ruler of the red land of Durotar in Kalimdor. In World of Warcraft, he is a level ?? faction leader located in Grommash Hold in the Valley of Wisdom, in the orcish city of Orgrimmar. He can also occasionally be found at the Mag'har stronghold of Garadar in Nagrand. Thrall's orcish name, which his parents chose but were unable to give him, is "Go'el." He is voiced by Harlan Hogan in Warcraft III.